The Global Cup trophy is the centerpiece of the tournament, reflecting the tenacity of human will and determination. 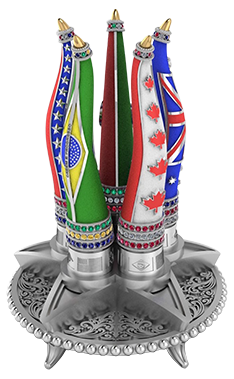 Comprising five individual bull horns representing the participating countries, the collective trophy symbolizes the unified spirit of this global competition. Each nation’s piece of the trophy also includes a vessel containing its native soil. Each event’s opening ceremonies sees the host’s riders depositing the dirt into their piece of the trophy, after which the battle ensues to determine who claims the dirt and host’s bull horn. The protection of native soil is a representation of national pride and honor for the teams and fans who enter competition bearing the colors of their country.